Wedding fashions come and go, and it seems like every new year brings fresh trends that define the modern wedding experience. From wedding attire to flower arrangements, wedding favors to reception themes, new trends can gain traction fairly quickly, and what was hot last year can turn decidedly cool by the time the new wedding season comes around. This is never more true than when it comes to catering, and the food choices available to the happy couple. Now, as always, your personal tastes should guide all of your planning decisions, and your wedding should ultimately reflect your own individual style. But knowing what’s hot and trending can help to inform your catering choices, and can present exciting alternatives to the tired old wedding fare. 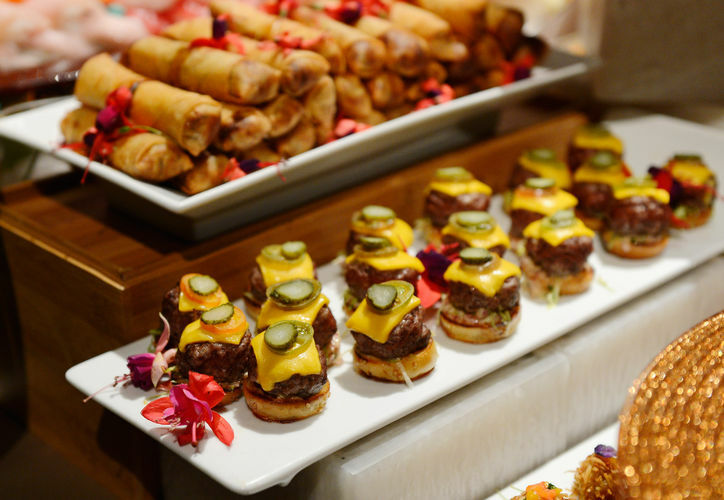 If you’re in the process of planning your wedding, consider the following exciting new trends in wedding catering. Every couple likes to add a personal touch to their wedding menu, and that often means incorporating family favorites into the food selection. But this year, wedding caterers are taking that one step further. Instead of the traditional main course choices ( “Did you order the chicken or the beef?”), couples are working with their caterers to offer ‘His and Her Courses’ for their guests. Working closely with their caterer, the wedding couple chooses family favorites that reflect their heritage and recreate happy childhood memories. The family traditions of both the bride and the groom are equally represented, and the guests get to choose between two exciting and heart warming courses. Even better, the mothers of both the bride and the groom get to boast that that was their child’s favorite meal growing up. Ask us about custom wedding menu options! Weddings can be expensive, and many couples are looking for creative ways to keep costs under control. One money saving tip is to schedule your wedding for the morning, as opposed to the afternoon or evening. Because most couples choose to plan their weddings for the afternoon or early evening, venues can be more difficult, and therefore more expensive, to book. By planning a morning wedding, it’s often easier to book the venue you want while saving a little money in the process. However, a morning wedding means that you need to reconsider the traditional reception menu. A lighter menu is called for, and a wedding brunch fits the bill perfectly. 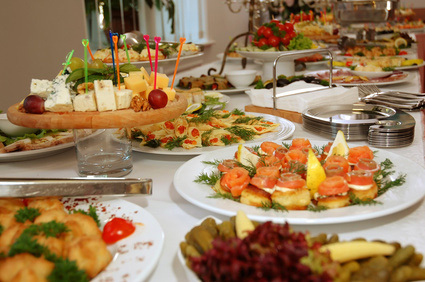 Your caterer can set up pancake bars and omelet stations, and your guests can have their selections cooked to order. A selection of fresh fruit will help to add variety and vibrancy, and guests can toast the happy couple with bloody marys and mimosas. One wedding menu trend that has been gaining momentum over the last few years is the tasting station. This is a welcome alternative to the often stodgy sit down meals of the past. A series of tasting stations, with chefs interacting with your guests and preparing delicacies on the spot, helps to create a lively atmosphere and keeps everybody’s energy up. You could have tasting stations with chefs preparing fresh sushi or shucking oysters on demand. For the kids, or the kids at heart, you can also have tasting stations devoted to the ultimate in ice cream sundaes or banana splits. If you are after a more sophisticated touch, you might include tasting stations with wine stewards offering the perfect pairing or a quality wine with a tasty amuse bouche. The old traditional wedding menu typically featured rather extravagant main courses, or at least the type of fare normally reserved for special occasions. But as trends change, couples are opting to incorporate their favorite comfort foods into their wedding menu. Whether it’s burgers or mac and cheese, these favorite comfort foods are getting a new makeover by catering chefs, transforming them into haute cuisine while maintaining their homey roots. This new type of high end comfort food adds a playful touch to the proceedings, and allows you to have a bit of fun with your wedding menu. Planning the perfect wedding menu takes time, and a close working relationship with your caterer. But new trends in wedding menus are giving couples exciting new alternatives to the stodgy fare of yesteryear. As you work with your caterer to prepare your wedding menu, think out of the box, and let your own tastes and style be your ultimate guide.